← ‘First one in last one out’ or is it ‘last one in first one out’? Does the brain decide what has priority? Is it human nature or the sociocultural mind-set we have nurtured that gives rise to our craving for approval from others to reassure our own distrust of personal performance? It was the wonderful world of Twitter that threw a lifeline to my suppressed desire for recognition; I say ‘suppressed’ because I have spent a lifetime waiting in the wings in my subconscious effort to gain sympathy and by some twisted form of psychological mumbo-jumbo, get people to notice me and say “you’re actually rather good”. However, I digress; maybe it was a slow day and I was looking at more Tweets than was healthy or was Kismet playing a part? I cannot recall but either way a Tweet heightened my curiosity. 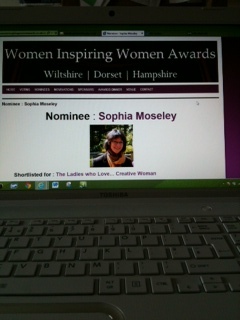 And so it was that on 6 April I decided to nominate myself for a Women Inspiring Women Award. I have to say it didn’t sit comfortably with my usually reserved personae but I had a New Year Resolution to achieve. 26 April email from the organisers confirming my nomination. It was a very bright and bouncy, positively worded and art-worked email that did have a cheering effect on me. The bullet point instructions were straight forward, one of which reminded me I had to be at the dinner ceremony on Friday 17 May to win a prize. The invitation was also open to family and friends and there was a special overnight deal with the hotel so you could really make a night of it. Maybe I should have stepped away at that point, but the bait was wriggling. 30 April “Congratulations you’ve been SHORTLISTED for an AWARD”. This was where I had to do the work – collecting votes. Now to those of you who voted for me and particularly as it seems the process was not easy, a big thank you. But the fact of the matter is, due to the nature of my work, I don’t get out much so my circle of acquaintances is small. But I kept repeating the mantra: you have to be in it to win it. There was another reminder and link (but no price) to book my ticket for the dinner. It wasn’t easy to organise, sons to collect from school, just enough time for a quick wash and brush before heading out of the door at 6pm to drive the 1½ hours to Salisbury. The hotel was packed to the gunnels with ladies and a few men dressed in their finery and the noise level was quite intimidating. It was not so much a friendly ‘formal’ chat amongst people who were getting to know one another, but more an excited social gathering of people who were getting fired up for a big party. Fish out of water? I was floundering just a little but put on a brave face and had a joke with the hotel staff. Dinner was tasty and my one spritzer used up my funds (having previously raided son’s piggy bank). The noise level increased as did the high spirits of some guests. The award ceremony was similar to any other with the nominees being identified (my brief moment of fame), the 3rd and 2nd runners up and finally the winners. 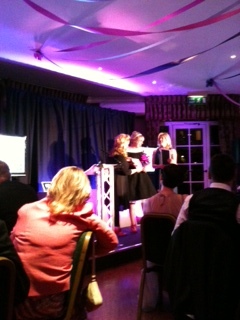 It seemed some of the winners were quite well known to other guests. A reminder that networking really does work! There was plenty of clapping and congratulations, photos were taken and tables cleared for the disco, at which point I made my discrete exit. 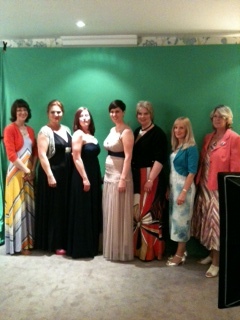 Ladies Who Love; a group of ladies who socialise and go to various big events. I seem to fall outside of that category. Damsels in Success: an organisation that helps women in business. I have been telling myself for some time I need an agent, but I’m not sure ‘writing’ is deemed to be big business anymore unless your name is JK Rowling! When I Googled the event I came across another annual award called Inspiring Women Awards that is now in its 21st year and raises a great deal of money for charity. So it seems us ladies have been celebrating our achievements for a while which is no bad thing. I did wonder if the event was a showcase for a local set of Wiltshire women, but the event is in its infancy so given time will perhaps spread further afield encouraging more women to break the glass ceiling of success by stepping forward and shouting about their success. If I want to win that award, perhaps I simply need to get out more and increase the size of my social network. Or perhaps I will wait quietly in the wings until someone recognises my creative talent and it won’t cost me a penny. This entry was posted in Life's Like That and tagged award, ceremony, inspiring, nominate, nominee, prize, red carpet, shortlisted, tweet, twitter, vote, women. Bookmark the permalink. 2 Responses to Was it The Red Carpet for me? Not this time round.